On 15 May, the European Commission published its first implementation report under the radioactive waste Directive 2011/70/EURATOM on the national radioactive waste reports and programmes. The report and its two staff working documents can be found here. They can also be downloaded using the links at the end of this article. “The report of the European Commission on the situation of radioactive waste in the EU member states makes for humbling reading. The often-made statement that we are creating a nuclear legacy for which we are not sufficiently prepared can hardly get a better illustration. The Commission concludes that there is still inadequate overview of current existing amounts of radioactive waste in Europe, and an estimate of future radioactive waste is fully missing because most member states have not taken this into account for upcoming decommissioning of old nuclear reactors or did not (yet) calculate this for plans for new nuclear investments. Given the fact that storage and disposal of low- and intermediate waste demands large efforts, and that a disposal solution for high level waste is still not operating anywhere in the world, this sheds doubts on the responsibility that the nuclear industry and authorities are taking in their nuclear plans. There needs to be full transparency about the production and management of this type of dangerous wastes. The problems Europe is facing with it, insufficient funding everywhere; insufficient safety precautions in some places; no existing solution in place anywhere, and an overoptimistic depiction of attempts in Finland, Sweden and France – should be more openly and honestly reflected in the justification of nuclear decisions. The public should be informed honestly and transparently about uncertainties and problems and given a chance to submit its concerns, viewpoints and questions before any decision is taken about the production of new radioactive waste, for instance in new nuclear projects and life-time extensions of existing ones, and in further projects for management of radioactive wastes. Only in this way we can reduce the chance that that future generations will fall victim to this generation’s nuclear legacy. Issues of large concern include the lack of sufficient funds for radioactive waste management, the lack of reflection on there not being any final disposal technologies implemented for high-level waste, the tendency of half of the Member States to want to find final solutions outside of their own borders. The national reports on which the Commission based its conclusions can be found here. There is within Germany from different sides still criticism on the operation of the Commission for the Storage of High Level Radioactive Waste, which did not permanently exclude the Gorleben site, that has been considered for final disposal of German high-level radioactive waste, from future siting decisions. The Commission instead refers this issue to the German Government that is to draft a legal regulation on siting during 2017. This includes issues of transparency, among others about role of a strategic environmental assessment and related public participation questions. The German regions want to have a say in the search for a repository for high radioactive waste. A series of workshops of the competent Commission for the Storage of High Level Radioactive Waste from the Federal Governmentand the Federal Council of Germany ended up with an unusually broad consensus of the participants. The participants demanded from politics and Commission to involve the public as widely and as early as possible in the forthcoming, decades-long search. Unfortunately a lot of this broad consensus wasn`t taken into account by the Commission. In addition the 111 persons that had sent comments during the final public consulting phase of the Commission`s report were not incorporated. In response to our request, the European Commission gave access to all national programmes and implementation reports on management of spent fuel and radioactive waste. According to Article 11 of Council Directive 2011/70/EURATOM, Member States had to develop and describe a national programme for the responsible and safe management of spent fuel and radioactive waste. The first programmes were, according to art. 14, to be reported to the European Commission before 23 August 2015. The 2011 Directive also requires Member States to submit, on a triennial basis, a National Report on progress made on implementing the Directive including progress made on implementing the national Programme. Member States are obliged to ensure that necessary information on the management of spent fuel and radioactive waste is made available to workers and the general public, and that the public is given the necessary opportunities to participate effectively in the decision-making process regarding spent fuel and radioactive waste management in accordance with national legislation and international obligations. The outcomes of the peer reviews shall be reported to the Commission and the other Member States. Member States are obliged to regularly review and update their national programmes, taking into account technical and scientific progress as appropriate as well as recommendations, lessons learned and good practices from peer reviews. After a Request from NTW for access to all national programmes, the European Commission released national programmes and reports. This is an important step forward in the transparency in the radioactive waste discussion. NTW has a habit – as transparency organisation – to publish important documentation and correspondence on our website. To find all the reports on one place allows citizens to have easy access to their national reports and compare them also with those of other countries. Some of the reports and programmes are still subject to further talks between the European Commission and the Member States. NTW will publish updated versions as soon as it will receive those from the Commission. NTW requested access to initially missing information in a confirmatory application, after which the European Commission granted access to some of that information and argued why other information (from Cyprus) remained confidential. NTW does not agree with the Commission that Regulation 1367/2006 (also called the Aarhus Regulation) would not be valid for the Euratom Treaty. This Regulation is not only part of EU environmental law under art. 192 of the Treaty of the Functioning of the European Union (TFEU) (as the Commission argues), but it is also part of transparency law valid for the EU and Euratom under art. 15 of the TFEU, which according to art. 106a of the Euratom Treaty is effective for the Euratom Treaty. National Programme, November 2014 & National Report (CS) – National Report (EN) – The Programme entitled “Update of the concept of radioactive waste and spent nuclear fuel management” is currently undergoing the SEA process and thus the final version is still to be finalized. On 4th April 2016 the European Commission published its latest communication on the Nuclear Illustrative Programme (PINC). The European Commission is required to regularly develop new Pinc outlining the goals of the nuclear sector. She has just published its first report since the accident at Fukushima Daiichi. PINC is a communication of the European Commission, presented under Article 40 of the Euratom Treaty for the opinion of the European Economic and Social Committee. PINC is a periodically (roughly every 7 years) issued overview from the European Commission indicating what kind of investments are foresees in the nuclear sector in the upcoming period. PINC does not indicate how much money the European Commission or the European Union or Euratom as governance structures are going to invest in nuclear. It gives over-all estimates in the sector. PINC furthermore does not give hard figures, but only soft estimates. European Industry Group Calls For comprehensive subsidies For New Build. For Foratom, the European Commission (EC) should establish clear guidelines on investment for nuclear new build in the forthcoming PINC. In a 2015 position paper, Foratom said more than 100 nuclear reactors would need to be commissioned over the next 35 years if Europe was to maintain at least the current capacity of nuclear generation. Asked about the eventual cost of such a major new build effort, Mr Ivens, Foratom’s institutional affairs director, said the required investment would probably be between €500bn and €800bn, based on recent estimates. But the cost of new-build are escalating and underestimated. Without lifetime extensions, around 90% of the EU’s existing nuclear reactors would be shut down by 2030. But even with lifetime extensions, 90% of existing nuclear electricity production capacity will need to be replaced before 2050. This will cost €350-500 billion, estimates the Commission. The PINC analyses different financing models in several EU Member States and underlines the understatement of the year by speaking about projects in the EU, which have experienced delays and cost overruns. The Finnish Olkiluoto and French Flamanville projects are both at over three times their original budgets and years behind schedule. WHICH INVESTMENTS ARE FORESEEN FOR NUCLEAR PLANT LIFE-TIME EXTENSIONS ? Upgrades for plant life-time extensions beyond the initial foreseen technical lifetime of reactors (of 30 or 40 years, depending on design), with safety upgrades “as far as reasonably practicable”, are supposed to need between 45 and 50 Bln Euro until 2050. This is a strange figure, because only France already will need to invest around 100 Bln Euro in the upgrade of its fleet until 2030, while closing down a third of it. Greenpeace furthermore had to conclude after the post-Fukushima stress tests that many important upgrades proposed for existing nuclear reactors were bogged down by “more studies” or delayed because of economic reasons. It is the back-end of the fuel cycle – waste management and decommissioning – that is going to claim a rising share of investments in the years ahead. More than 50 of the EU’s 131 reactors are likely to be shut down by 2025, and there are still many unkowns. Only 3 reactors in Europe have so far been completely decommissioned – all of them in Germany. The European commission wants Europe to become leader in decommissioning technology and experience. Member States expect to need a total of 253 Bln Euro for decommissioning and waste until 2050 – 123 Bln Euro for decommissioning and 130 Bln Euro for spent nuclear fuel and nuclear waste management. This does not include costs expected after 2050, which could be more than this amount, because most countries only expect to start implementing radioactive waste depositories after 2050. Currently, there is only 150 Bln Euro aggregated in dedicated funds. About Nuclear waste, Member States will need to move from research to action on geological disposal. The first facilities are expected to be up and running in Finland, Sweden and France between 2020 and 2030 (Finland is in the lead with a due date of 2023). Almost all other Member States are at the “preliminary studies” stage. Public acceptance remains a challenge. The projected costs of long-term geological storage depositories run from less than half a billion in Slovenia and Croatia to over €20 billion in France, according to PINC. It all adds up to €68 billion, or nearly half of the total estimated waste management costs of €142 billion out to 2050. For these, the average result of €3.23 per MWh is more than double what was estimated in recent studies, the Commission notes. Over a third of the total costs are for France. The other half of the end-of-life equation, decommissioning, is largely unknown terrain. Experience is rare: although 89 reactors had been permanently closed in Europe as of October 2015, only three have been fully decommissioned and all three were in Germany. Worldwide, only 13 more have been decommissioned; all of them in the US. The costs are difficult to estimate. The Commission comes up with a total cost of €126 billion for decommissioning out to 2050. Some will argue that real costs are likely to be far higher. Estimates of decommissioning costs per unit also vary “significantly” between Member States, from €0.20 billion in Finland to €1.33 billion in Lithuania. Germany and the UK are at the high end (€1.06 billion and €0.85 billion, respectively) while France is at the low end (€0.32 billion). Decommissioning costs vary according to reactor type and size, location, the proximity and availability of disposal facilities, the intended future use of the site and the condition of the reactor at the time of decommissioning. Although decommissioning might gradually become cheaper, the cost of final waste depositories is largely unknown and costs could also grow, rather than shrink, over the many decades in question. Among EU member states still operating nuclear plants, only Britain’s operators have enough dedicated assets to cover the expected costs, 63 billion euros, according to the PINC. But the UK government has taken over all financial responsibility for”legacy” waste and facilities, i.e everything except new build.Does the Commission state that we have to keep nuclear energy in order to be able to collect funds for the decommissioning and RWM? In Sweden nuclear energy is already non-competitive with the present low electricity prices. Raising the nuclear waste fees will make the situation even worse. However, starting to phase out the reactors will likely lead to higher electricity prices so that the remaining reactors can pay higher fees. So a phase-out strategy will likely maximize the collected funds. In Europe, the finally collected funds won’t reach a level where the government will not have to step in towards the end. France, which operates Europe’s largest fleet of nuclear plants, is heavily underfunded. It has earmarked assets only worth 23 billion euros, less than a third of 74.1 billion euros in expected costs. In Germany, an extra 7.7 billion euros is needed on top of the current 38 billion euros. • The Commission hopes that standardisation of designs will push down construction prices of new nuclear. • The European Commission opens up the possibility for Member States to develop shared nuclear waste repositories. This is a dangerous development that may entice some Member States (e.g. 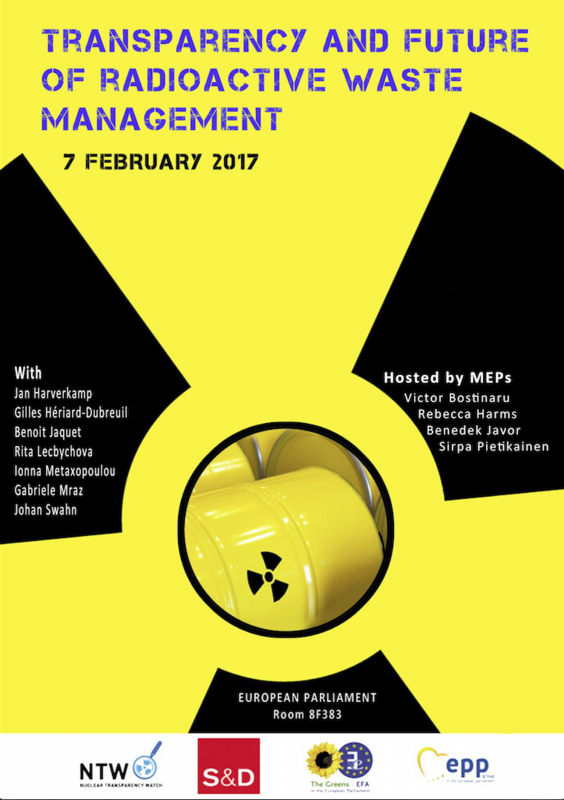 Hungary, Slovenia, the Netherlands, Lithuania) to slow down the development of their own nuclear waste management in order to wipe it under the carpet somewhere else. • There is a gap of 123 Bln Euro for decommissioning and waste funds until 2050. Since NTW was established at the end of 2013 one of the key activities has been the development of projects within the Radioactive Waste Management (RWM) field. An NTW working group on RWM issues was established at an early stage by a core group of NTW members, who are the authors of this report. One of the first projects developed within the NTW RWM working group was on transparency and it was named the BEPPER project. BEPPER stands for “Broad Framework for Effective Public Information and Participation in Environmental Decision-making in Radioactive Waste Management. This report describes some of the innovative thinking and practice on transparency that has been developed in the project during the first two years. The consultancy company CiviQ has provided valuable contributions into the report. Transparency of high quality is essential to an enduring and constructive engagement of civil society in the area of radioactive waste management (RWM). Primarily transparency in RWM is important because it can improve the safety of RWM projects, facilities and repositories. Effective transparency can also lead to more effective and transparent decision-making processes that ensure the involvement of civil society on local, national and international levels. Better decision-making processes can increase civil society’s confidence, or trust, in the quality and fairness of RWM decision-making processes. There are various definitions and levels of understanding of the concept and the practice of transparency. Within the nuclear sector definitions usually include processes for enabling public information and communication and participation and engagement of civil society in decision-making. However, there is, as yet, no single agreed definition of what constitutes effective transparency that leads to good results. In the report a first section attempts to provide an understanding of the concept of transparency in relation to RWM and to describe effective transparency processes. In the section the “NTW BEPPER Pillars for Effective Transparency”, i.e., the NTW BEPPER pillar, are introduced. There are systems of international governance for how transparency, generally and in RWM in particular, could or should be achieved. Of special importance in this regard is the full implementation of the Aarhus Convention in national legislation. In addition there is a need to make available resources to enable robust public participation. The implementation of such governance at European and national levels as well as experience from various projects studying or developing transparency in practice has led to considerable experience on how transparency can be effectively implemented. In the report this experience is collated and distilled into a set of categories and criteria called the “NTW BEPPER Key Components of Effective Transparency in RWM”, i.e. the NTW BEPPER key components. It is of importance to be able to evaluate the effectiveness of a governance system for transparency in RWM. A key objective of the work of the NTW RWM working group has been to initiate and work towards the development of such a governance system. This report is a major step in that direction. In the third chapter of the report a system of levels is presented describing a progressively better and more effective form of transparency governance. This tool is called the “NTW BEPPER Level System for Evaluation of Effective Transparency in RWM”, i.e. the NTW BEPPER levels. The levels are described for each of the fields of public information and communication, public participation and consultation, access to justice and decision-making, and access to resources for participation. In order to be able to compare different transparency governance systems, for example between countries, some indicators are required. Such indicators could also be used to set criteria for transparency governance, for example in relation to compliance with European legislation regarding nuclear issues. Towards the end of the report some reflections are made on comparative evaluation of effective RWM transparency governance. Finally the report offers some general reflections regarding transparency in RWM and gives some recommendations for moving forward. On 7 september, the European Economic and Social Committee (EESC) organised with active involvement from the Commission’s Joint Research centre (JRC) a workshop on public participation in the area of Radioactive Waste Management. On 19 July 2011 the European Commission adopted the Directive 2011/70/EURATOM, establishing a Community framework for the responsible and safe management of spent fuel and radioactive waste. In 2014, the Energy – Transparency Centre of Knowledge – a joint initiative established by the Commission’s Joint Research centre (JRC) and DG ENER for promoting public participation in energy policy implementation, selected radioactive waste management as the area of interest for its pilot project. A vast survey was carried out, in order to collect data on initiatives and practices with regard to public participation in RWM across the EU. One year after, this workshop was an opportunity for reviewing and providing critical assessment of the information gathered within that exercise. The event bourght together about 50 representatives of national/subnational authorities and agencies, Civil society (municipalities, NGOs) and nuclear industry as well as other key stakeholders.